Though hub motors tend to be fairly well behaved and can run for years without problems, they do occasionally go wrong. If the bike suddenly stops working or develops problems, you often end up in a position where you need to find out if it’s the controller or the motor that’s at fault. Many enthusiasts who’ve done a lot of tinkering with their bikes usually end up with at least one spare controller lying around, in which case it’s just a case of swapping it out to see if that fixes the problem. Most people, however, do not have spares available and may need to do some specific testing to rule out any issues with the motor. 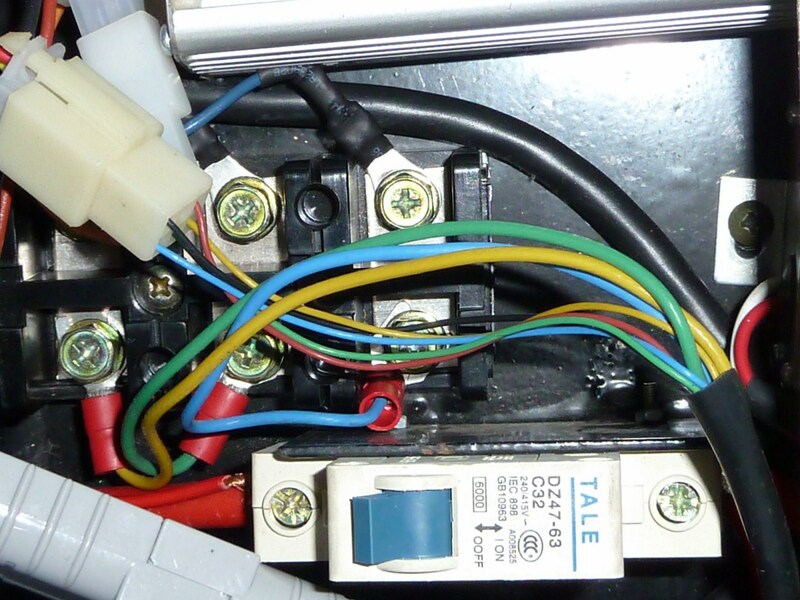 The first thing to do is to remove the seat to get access to the junction where the phase wires are connected (bottom) and the hall connector socket can be found (top left). The phase wires are the three, thick blue, green and yellow wires. 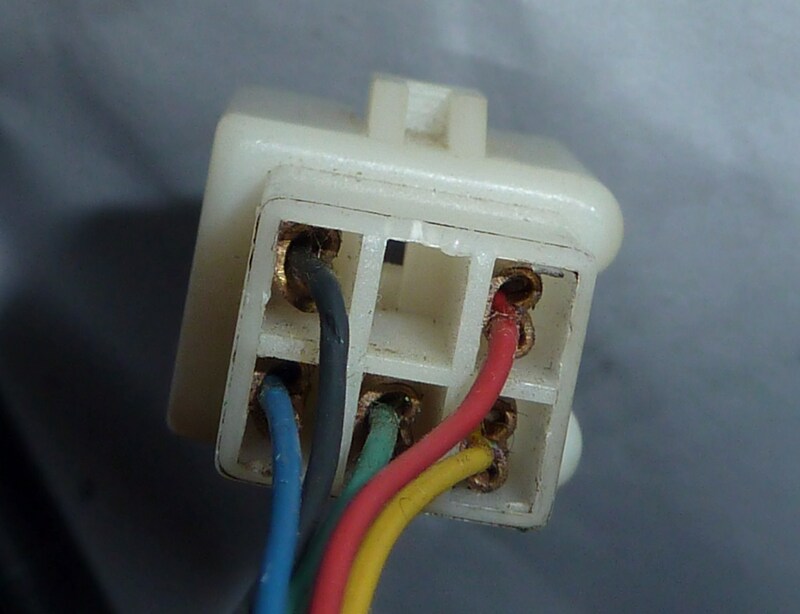 The hall sensor wires are five thin wires: black, red, blue, green and yellow that run from the motor cable to a 6-way mini-connector. 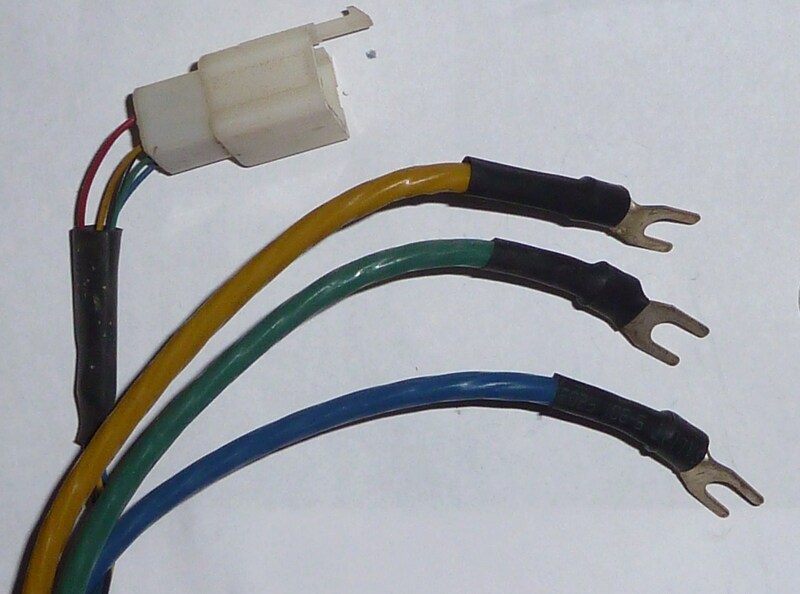 On some bikes the phase wires are part of a plug instead, in which case you’ll have to adapt your test accordingly. For this test you will need to detach the phase wires on the motor side from the connection block so that they are isolated from the controller. Leave the hall connector connected, though. The phase wires are the wires that provide power to the motor, magnetising sequences of coils that generate the rotational motion. The hall sensors are three little transistor-like devices embedded along the inside edge of the motor, which send information about the motor movement back to the controller. 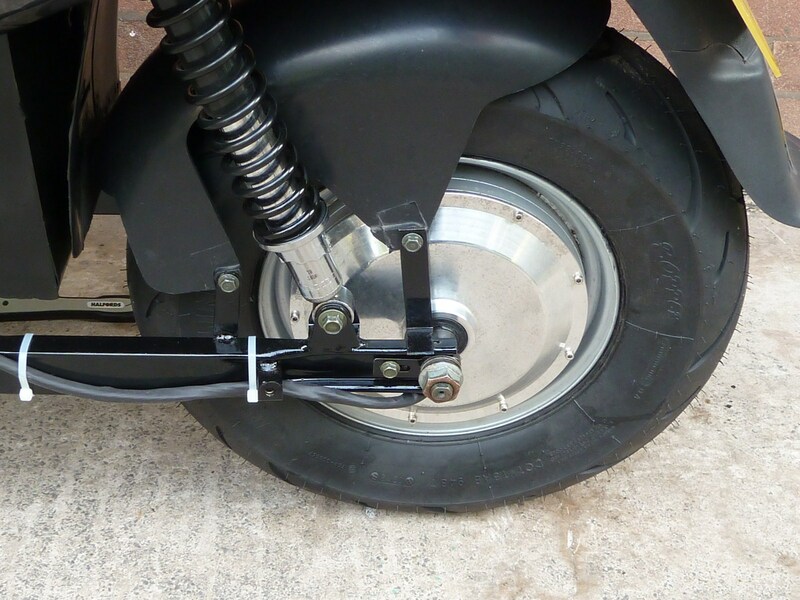 First, with the bike on its stand (and the bike switched off), test that the rear wheel spins freely. If it doesn’t you most likely have a short between the phase wires, though this is rare. The next thing to do is to remove the phase wires from the block and short them one pair at a time (e.g: yellow/green, green/blue, blue/yellow). As you hold them shorted together, try turning the wheel again. This time, you should find resistance. If you don’t get resistance when any pair of wires is shorted, then there is a break somewhere between the phase wire and the motor. For the next test keep the phase wires disconnected but make sure that they are kept properly separated. Preferably put a bit of insulation tape on the ends to prevent mishaps. Again, keep the hall connector connected. Next, you will need to turn the ignition on, and take voltage readings from the wires in the hall connector. Since the connector is plugged in, you will need to access it from the rear, sticking the multimeter probes into the recesses and touching the crimps holding the wires in place. Take voltage readings across the black wire and – in turn – the blue, green and yellow wires with the back wheel turning slowly. It’s best to get someone to help out with turning the wheel for this part, while you take readings. As the wheel turns, the signal should flip between 0V and about 4.5V, at a rate of about 23 cycles per rotation of the wheel. If you get this reading from each of the wires, then all is well, otherwise, you have a blown hall sensor and will need to open the motor to replace it. If you have a bit of pocket money spare, and want to make life easier, you could invest in one of these very handy motor/controller tester gadgets that will do it all for you. You just plug in the hall connector, attach clips to the phase wires, and the blinky lights give you the answers straight away! 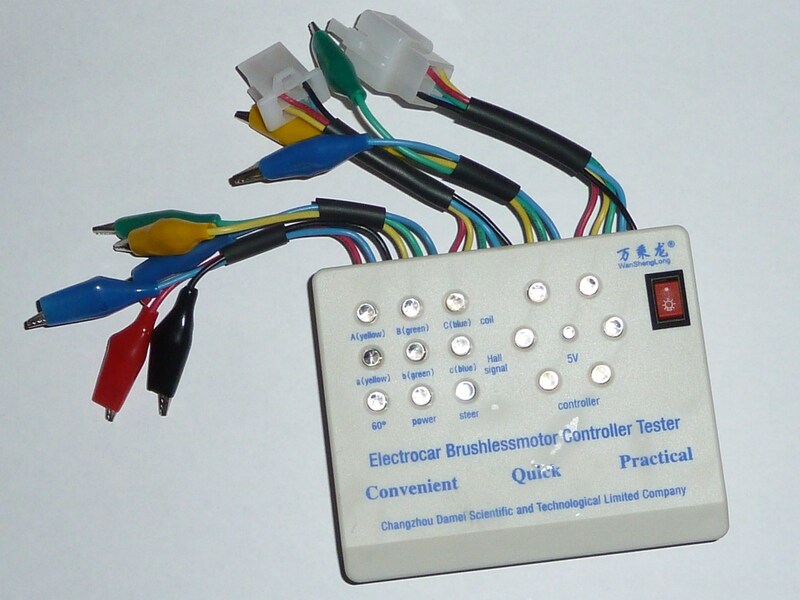 The controller-tester part of the unit, however, is only compatible with controllers up to 60V, though, so it can test the motor – but not the controller – if you have a 72V system. You are currently browsing the archives for the 4.9.1. Testing the Hub Motor category.